A transit of Venus across the Sun takes place when the planet Venus passes directly between the Sun and a superior planet, becoming visible against (and hence obscuring a small portion of) the solar disk. During a transit, Venus can be seen from Earth as a small black disk moving across the face of the Sun. The duration of such transits is usually measured in hours (the transit of 2012 lasted 6 hours and 40 minutes). A transit is similar to a solar eclipse by the Moon. While the diameter of Venus is more than 3 times that of the Moon, Venus appears smaller, and travels more slowly across the face of the Sun, because it is much farther away from Earth. The last transit of Venus was on 5 and 6 June 2012, and was the last Venus transit of the 21st century; the prior transit took place on 8 June 2004. The previous pair of transits were in December 1874 and December 1882. The next transits of Venus will be on 10–11 December 2117, and 8 December 2125. 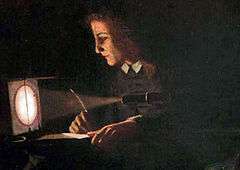 In a paper published in 1691, and a more refined one in 1716, he proposed that more accurate calculations could be made using measurements of a transit of Venus, although the next such event was not due until 1761. Halley died in 1742, but in 1761 numerous expeditions were made to various parts of the world so that precise observations of the transit could be made in order to make the calculations as described by Halley—an early example of international scientific collaboration. This collaboration was, however, underpinned by competition, the British, for example, being spurred to action only after they heard of French plans from Joseph-Nicolas Delisle. In an attempt to observe the first transit of the pair, astronomers from Britain, Austria and France traveled to destinations around the world, including Siberia, Norway, Newfoundland and Madagascar. Most managed to observe at least part of the transit, but successful observations were made in particular by Jeremiah Dixon and Charles Mason at the Cape of Good Hope. Less successful, at Saint Helena, were Nevil Maskelyne and Robert Waddington, although they put the voyage to good use by trialling the lunar-distance method of finding longitude. For the 1769 transit, scientists traveled to Tahiti, Norway, and locations in North America including Canada, New England, and San José del Cabo (Baja California, then under Spanish control). The Czech astronomer Christian Mayer was invited by Catherine the Great to observe the transit in Saint Petersburg with Anders Johan Lexell, while other members of the Russian Academy of Sciences went to eight other locations in the Russian Empire, under the general coordination of Stepan Rumovsky. The Hungarian astronomer Maximilian Hell and his assistant János Sajnovics traveled to Vardø, Norway, delegated by Christian VII of Denmark. William Wales and Joseph Dymond made their observation in Hudson Bay, Canada, for the Royal Society. Observations were made by a number of groups in the British colonies in America. In Philadelphia, the American Philosophical Society erected three temporary observatories and appointed a committee, of which David Rittenhouse was the head. Observations were made by a group led by Dr. Benjamin West in Providence, Rhode Island, and published in 1769. The results of the various observations in the American colonies were printed in the first volume of the American Philosophical Society's Transactions, published in 1771. Comparing the North American observations, William Smith published in 1771 a best value of the solar parallax of 8.48 to 8.49 arc-seconds, which corresponds to an Earth-Sun distance of 24,000 times the Earth's radius, about 3% different from the correct value. There was a good deal of interest in the 2004 transit as scientists attempted to measure the pattern of light dimming as Venus blocked out some of the Sun's light, in order to refine techniques that they hope to use in searching for extrasolar planets. Current methods of looking for planets orbiting other stars only work for a few cases: planets that are very large (Jupiter-like, not Earth-like), whose gravity is strong enough to wobble the star sufficiently for us to detect changes in proper motion or Doppler shift changes in radial velocity; Jupiter or Neptune sized planets very close to their parent star whose transit causes changes in the luminosity of the star; or planets which pass in front of background stars with the planet-parent star separation comparable to the Einstein ring and cause gravitational microlensing. Measuring light intensity during the course of a transit, as the planet blocks out some of the light, is potentially much more sensitive, and might be used to find smaller planets. However, extremely precise measurement is needed: for example, the transit of Venus causes the Sun's light to drop by a mere 0.001 magnitude, and the dimming produced by small extrasolar planets will be similarly tiny. 4 June Cook sent to Tahiti to observe the transit, Chappe to San José del Cabo, Baja California and Maximilian Hell to Vardø, Norway. 9 December 1874 01:49 04:07 06:26 Pietro Tacchini leads expedition to Muddapur, India. A French expedition goes to New Zealand's Campbell Island and a British expedition travels to Hawaii. 6 December 1882 13:57 17:06 20:15 John Philip Sousa composes a march, the "Transit of Venus", in honor of the transit. 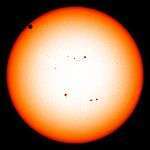 8 June 2004 05:13 08:20 11:26 Various media networks globally broadcast live video of the Venus transit. 11 December Visible in entirety in eastern China, Korea, Japan, Taiwan, Indonesia, and Australia. Partly visible on extreme U.S. West Coast, and in India, most of Africa, and the Middle East. 8 December 2125 13:15 16:01 18:48 Visible in entirety in South America and the eastern U.S. Partly visible in Western U.S., Europe, and Africa. 11 June 2247 08:42 11:33 14:25 Visible in entirety in Africa, Europe, and the Middle East. Partly visible in East Asia and Indonesia, and in North and South America. 9 June 2255 1:08 4:38 08:08 Visible in entirety in Russia, India, China, and western Australia. Partly visible in Africa, Europe, and the western U.S.
13 December Visible in entirety in Australia and most of Indonesia. Partly visible in Asia, Africa, and the western half of the Americas. 10 December 2368 12:29 14:45 17:01 Visible in entirety in South America, western Africa, and the U.S. East Coast. Partly visible in Europe, the western U.S., and the Middle East. 12 June 2490 11:39 14:17 16:55 Visible in entirety through most of the Americas, western Africa, and Europe. Partly visible in eastern Africa, the Middle East, and Asia. 10 June 2498 03:48 07:25 011:02 Visible in entirety through most of Europe, Asia, the Middle East, and eastern Africa. Partly visible in eastern Americas, Indonesia, and Australia. The simultaneous occurrence of a transit of Mercury and a transit of Venus does occur, but extremely infrequently. Such an event last occurred on 22 September 373,173 BC and will next occur on 26 July 69,163, and again on 29 March 224,508. The simultaneous occurrence of a solar eclipse and a transit of Venus is currently possible, but very rare. The next solar eclipse occurring during a transit of Venus will be on 5 April 15,232. The last time a solar eclipse occurred during a transit of Venus was on 1 November 15,607 BC. It could be noticed that the day after the Venerean transit of 3 June 1769 there was a total solar eclipse, which was visible in Northern America, Europe and Northern Asia. ↑ McClure, Bruce (29 May 2012). "Everything you need to know: Venus transit on June 5–6". EarthSky. Earthsky communications Inc. Retrieved 2 June 2012. ↑ Langford, Peter M. (September 1998). "Transits of Venus". La Société Guernesiaise Astronomy Section web site. Astronomical Society of the Channel Island of Guernsey. Retrieved 1 March 2012. ↑ Shortt, David (22 May 2012). 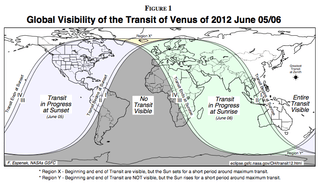 "Some Details About Transits of Venus". Planetary Society web site. The Planetary Society. Retrieved 22 May 2012. ↑ Westfall, John E. (November 2003). "June 8, 2004: The Transit of Venus". Archived from the original on 8 August 2007. Retrieved 25 September 2006. ↑ Westfall, John E. "June 8, 2004: The Transit of Venus". alpo-astronomy.org. Retrieved 8 December 2009. ↑ Klotz, Irene (6 June 2012). 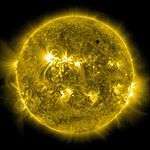 "Venus transit offers opportunity to study planet's atmosphere (+video)". Christian Science Monitor. Retrieved 2012-06-06. 1 2 "Venus compared to Earth". European Space Agency. 2000. Retrieved 25 September 2006. ↑ Giesen, Juergen (2003). 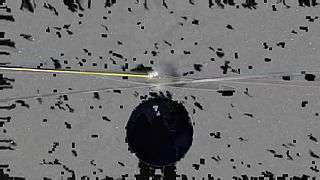 "Transit Motion Applet". Retrieved 26 September 2006. 1 2 3 4 5 Espenak, Fred (11 February 2004). 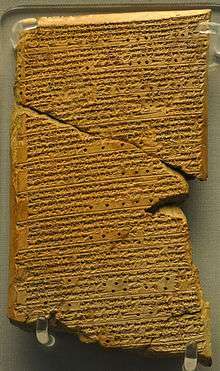 "Transits of Venus, Six Millennium Catalog: 2000 BCE to 4000 CE". NASA. Archived from the original on 24 June 2011. ↑ Walker, John. "Transits of Venus from Earth". Fourmilab Switzerland. Retrieved 21 September 2006. ↑ Rincon, Paul (7 November 2005). 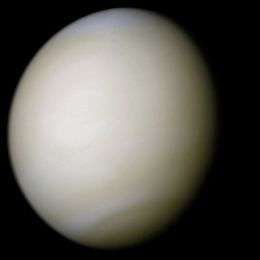 "Planet Venus: Earth's 'evil twin'". BBC. Retrieved 25 September 2006. ↑ Morley, Sylvanus G. (1994). The Ancient Maya (5th ed.). Stanford University Press. ISBN 978-0-8047-2310-7. ↑ Böhm, Bohumil; Böhm, Vladimir. "The Dresden Codex – the Book of Mayan Astronomy". Retrieved 25 September 2006. ↑ Allen, Jesus Galindo; Allen, Christine (2005). "Maya Observations of the 13th Century transits of Venus?". Proceedings of the International Astronomical Union:. IAU. 196: 124–137. Bibcode:2005tvnv.conf..124G. doi:10.1017/S1743921305001328. ISBN 978-0-521-84907-4. ISSN 1743-9213. Retrieved 31 August 2013. ↑ van Gent, Robert H. "Transit of Venus Bibliography". Retrieved 11 September 2009. ↑ Kollerstrom, Nicholas (2004). "William Crabtree's Venus transit observation" (PDF). Proceedings IAU Colloquium No. 196, 2004. International Astronomical Union. Retrieved 10 May 2012. 1 2 Marston, Paul (2004). Jeremiah Horrocks—young genius and first Venus transit observer. University of Central Lancashire. pp. 14–37. ↑ Teets, D.A. (2003). "Transits of Venus and the Astronomical Unit". Mathematics Magazine. 76: 335–348. JSTOR 3654879. ↑ Halley, Edmund (1716). "A New Method of Determining the Parallax of the Sun, or His Distance from the Earth". Philosophical Transactions. XXIX: 454. Archived from the original on 24 June 2011. ↑ Leverington, David (2003). Babylon to Voyager and beyond: a history of planetary astronomy. Cambridge, UK: Cambridge University Press. pp. 140–142. ISBN 0-521-80840-5. 1 2 3 4 Pogge, Prof. Richard. "Lecture 26: How far to the Sun? The Venus Transits of 1761 & 1769". Retrieved 25 September 2006. ↑ "Oxford Dictionary of National Biography: Jeremiah Dixon". Oxford University Press. Retrieved 22 February 2012. ↑ Howse, Derek (1989). Nevil Maskelyne: The Seaman's Astronomer. Cambridge: Cambridge University Press. ↑ Vladimir Shiltsev (1970). "Lomonosov's Discovery of Venus Atmosphere in 1761: English Translation of Original Publication with Commentaries". arXiv:1206.3489 [physics.hist-ph]. ↑ Marov, Mikhail Ya. (2004). "Mikhail Lomonosov and the discovery of the atmosphere of Venus during the 1761 transit". Proceedings of the International Astronomical Union. Cambridge University Press. 2004: 209–219. Bibcode:2005tvnv.conf..209M. doi:10.1017/S1743921305001390. ↑ Sheehan, Jay; Sheehan, William (2012). 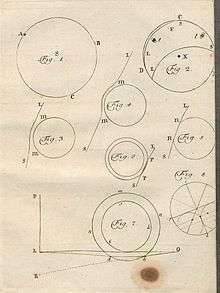 "Lomonosov, the Discovery of Venus's Atmosphere, and Eighteenth-century Transits of Venus". Journal of Astronomical History and Heritage. 15: 1. Bibcode:2012JAHH...15....3P. ↑ Alexandre Koukarine; Igor Nesterenko; Yuri Petrunin; Vladimir Shiltsev (2012-08-27). "Experimental Reconstruction of Lomonosov's Discovery of Venus's Atmosphere with Antique Refractors During the 2012 Transit of Venus". arXiv:1208.5286 [physics.hist-ph]. ↑ Shiltsev, V.; Nesterenko, I.; Rosenfeld, R. (2013). "Replicating the discovery of Venus's atmosphere". Physics Today. 66 (2): 64. doi:10.1063/pt.3.1894. ↑ "James Cook and the Transit of Venus". NASA Headline News: Science News. nasa.gov. Retrieved 6 June 2012. ↑ Mayer, Christian; Parsons, James (1764). 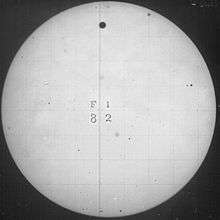 "An Account of the Transit of Venus: In a Letter to Charles Morton, M. D. Secret. R. S. from Christian Mayer, S. J. Translated from the Latin by James Parsons, M. D". Philosophical Transactions of the Royal Society. 54: 163–164. Bibcode:1764RSPT...54..163M. doi:10.1098/rstl.1764.0030. ↑ Catherine B. Hurst, Choosing Providence, March 23, 2012. Retrieved 20 April 2016. ↑ American Philosophical Society, Transactions (Old Series, vol. 1, 1769–71): see Google Books link (retrieved 20 April 2016). ↑ W. Smith, "The Sun's Parallax deduced from a comparison of the Norriton and some other American Observations of the Transit of Venus 1769, with the Greenwich and other European Observations of the Same," Transactions of the American Philosophical Society, Vol 1 (1871), p. 54–72. Solar parallax is defined as "the angle which the Earth's semi-diameter [i.e., radius] subtends at the sun". ↑ See, for example, Stanley, David (2004). "Moon Handbooks South Pacific" (8th ed.). Avalon Travel Publishing: 175. ISBN 978-1-56691-411-6. ↑ Rhys, Ernest, ed. (1999). The Voyages of Captain Cook. Wordsworth Editions Ltd. pp. 29–30. ISBN 1-84022-100-3. ↑ "Explanation of the Black-Drop Effect at Transits of Mercury and the Forthcoming Transit of Venus". AAS. 4 January 2004. Archived from the original on 10 July 2006. Retrieved 21 September 2006. 1 2 3 4 "Transits of Venus – Kiss of the goddess". The Economist. 27 May 2004. Retrieved 25 September 2006. ↑ R. P. Maximiliani Hell e S. J. – Observatio transitus Veneris ante discum Solis die 3. junii anno 1769. Wardoëhusii, auspiciis potentissimi ac clementissimi regis Daniae et Norvegiae, Christiani septimi, facta et societati reg. scientiarum Hafniensi die 24. Novembris 1769. Praelecta. Hafniae, typ. Orphanotrophii regii, excudit Gerhard Wiese Salicath, 82 p.
↑ De parallaxi Solis ex observationibus transitus Veneris anni 1769. Vindobonae, 1772, typ. J. Trattner, 116 p.
↑ "1874 transit". Royal Society. Retrieved 2015-03-06. ↑ European Southern Observatory. "The Venus Transit 2004". Retrieved 2012-06-06. ↑ European Southern Observatory. "Summing Up the Unique Venus Transit 2004 (VT-2004) Programme". Retrieved 2012-06-06. ↑ McKee, Maggie (6 June 2004). "Extrasolar planet hunters eye Venus transit". New Scientist. Retrieved 27 September 2006. ↑ Gould, A.; et al. (10 June 2006). "Microlens OGLE-2005-BLG-169 Implies That Cool Neptune-like Planets Are Common". The Astrophysical Journal Letters. The American Astronomical Society. 644 (1): L37–L40. arXiv:astro-ph/0603276 . Bibcode:2006ApJ...644L..37G. doi:10.1086/505421. ↑ Espenak, Fred (18 June 2002). 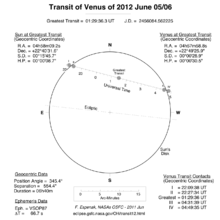 "2004 and 2012 Transits of Venus". NASA. Retrieved 25 September 2006. ↑ Wall, Michael (16 May 2012). "Venus Transit On June 5 May Bring New Alien Planet Discoveries". space.com. TheHuffingtonPost.com, Inc. Retrieved 21 May 2012. ↑ "The Venus Twilight Experiment: Refraction and scattering phenomena during the transit of Venus on June 5–6, 2012", venustex.oca.eu. ↑ "NASA - Catalog of Transits of Venus". NASA. Retrieved 2016-05-26. ↑ Bell, Steve (2004). "Transits of Venus 1000 AD – 2700 AD". HM Nautical Almanac Office. Archived from the original on 7 September 2006. Retrieved 25 September 2006. ↑ Winthrop, John (1764). "Observation of the Transit of Venus, June 6, 1761, at St. John's, Newfoundland". Philosophical Transactions of the Royal Society. 54: 279–283. doi:10.1098/rstl.1764.0048. ↑ Espenak, Fred (21 April 2005). "Transits of Mercury, Seven Century Catalog: 1601 CE to 2300 CE". NASA. Retrieved 27 September 2006. ↑ Jeliazkov, Jeliazko. "Simultaneous occurrence of solar eclipse and a transit". transit.savage-garden.org. Retrieved 11 August 2009. ↑ de La Lande, Jérôme; Messier, Charles (1769). "Observations of the Transit of Venus on 3 June 1769, and the Eclipse of the Sun on the Following Day, Made at Paris, and Other Places. Extracted from Letters Addressed from M. De la Lande, of the Royal Academy of Sciences at Paris, and F. R. S. to the Astronomer Royal; And from a Letter Addressed from M. Messier to Mr. Magalhaens". Philosophical Transactions (1683–1775). 59 (0): 374–377. Bibcode:1769RSPT...59..374D. doi:10.1098/rstl.1769.0050. Hufbauer, Karl (1991). 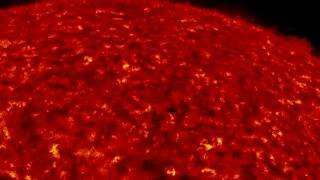 Exploring the Sun, Solar Science Since Galileo. Baltimore: The Johns Hopkins University Press. pp. 29–30. ISBN 0-8018-4098-8. Chauvin, Michael (2004). Hokuloa: The British 1874 Transit of Venus Expedition to Hawaii. Honolulu: Bishop Museum Press. ISBN 1-58178-023-0. Maunder, Michael; Moore, Patrick (2000). Transit: When Planets Cross the Sun. London: Springer-Verlaf. ISBN 1-85233-621-8. Sellers, David (2001). The Transit of Venus: The Quest to Find the True Distance of the Sun. Leeds, UK: Magavelda Press. ISBN 0-9541013-0-8. Simaan, Arkan (May 2004). "The transit of Venus across the Sun" (PDF). Physics Education. 39 (3): 247–251. Bibcode:2004PhyEd..39..247S. doi:10.1088/0031-9120/39/3/001. Wikimedia Commons has media related to Transit of Venus.